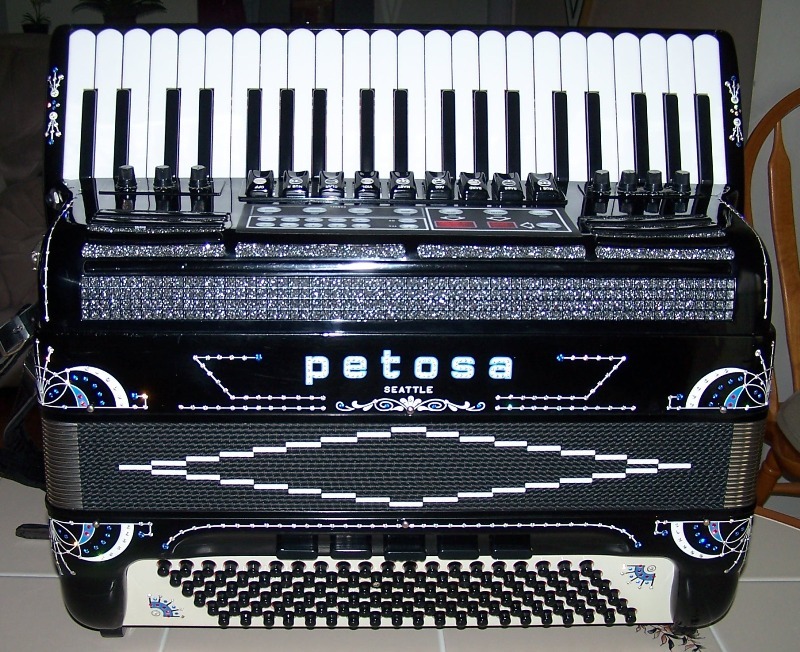 It is a pleasure to offer a professional Petosa P 800 Musette MIDI accordion, fully programmed and ready to be used. 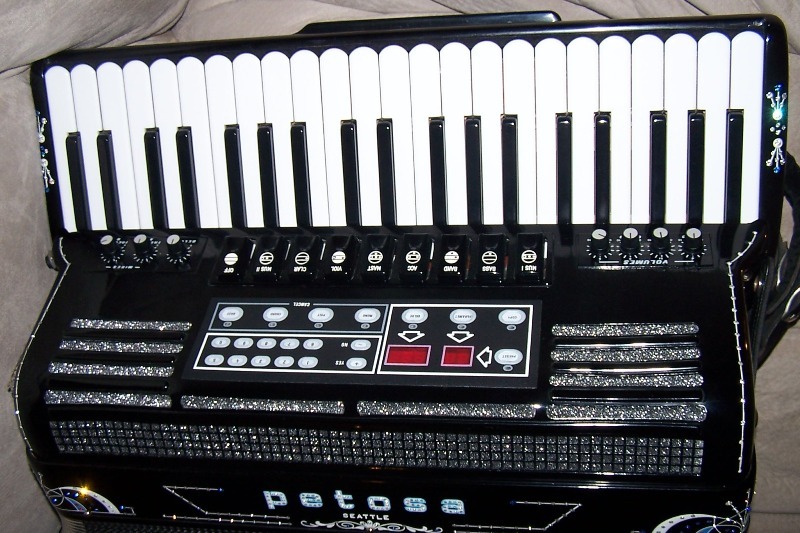 This instrument features the famous Petosa hand-made reeds and solid walnut keyboard. The mechanics is indestructible. The tone is rich and powerful. 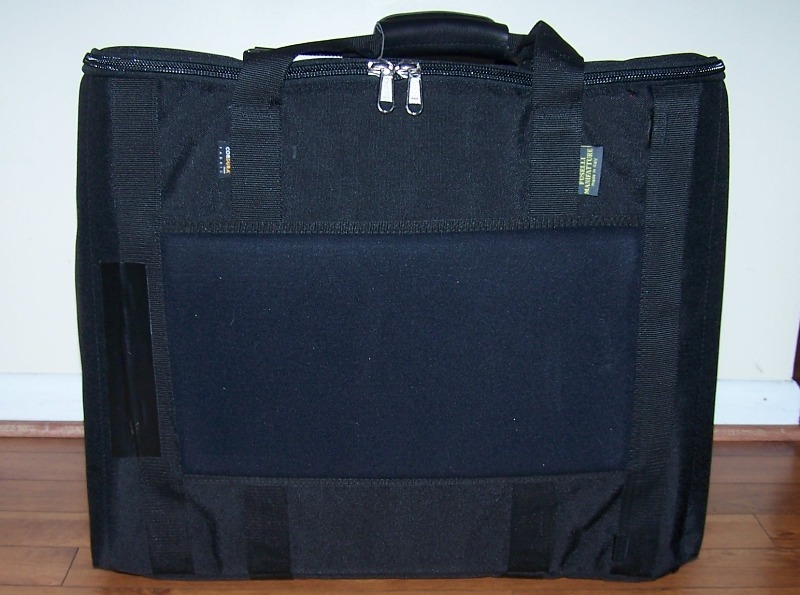 With one set of bassoon reeds and three sets of clarinet reeds the instrument features both concert and musette sounds. Two of the clarinet reed sets are concert tuned (along with the bassoon and the bass side) and the third one is set for Italian musette. 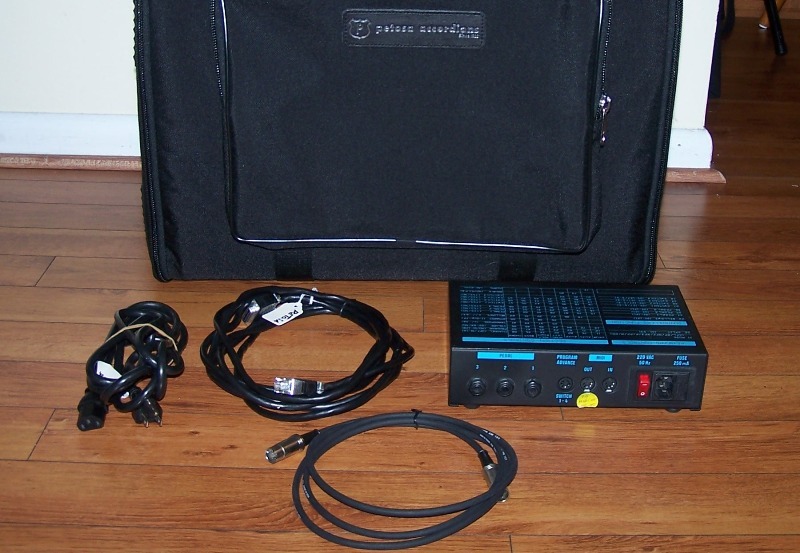 The 5 bass switches would allow you to find the perfect balance between treble and bass. 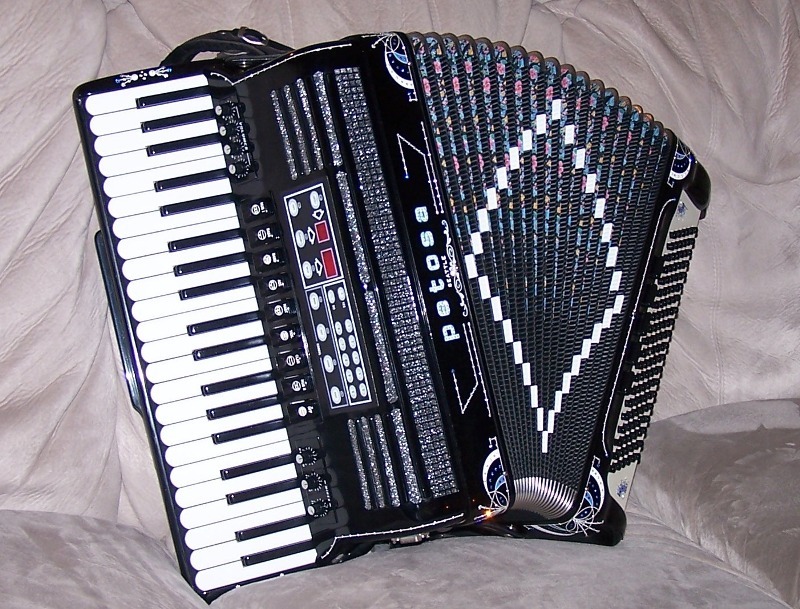 In addition to the excellent acoustic features, the accordion has excellent stereo amplification and a full MIDI installation with very friendly grill controller. 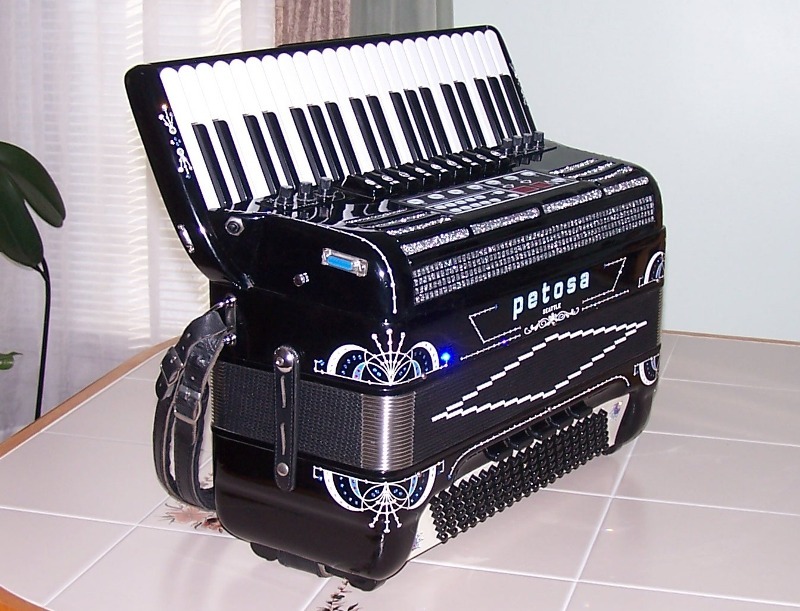 You can play this accordion as a fine acoustic instrument, as amplified accordion, as a MIDI instrument sounding like a full orchestra, or in any combination. 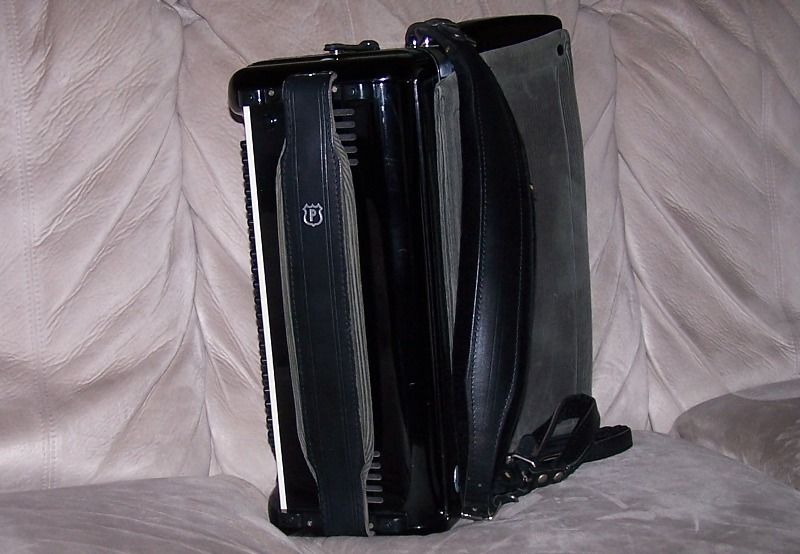 9 treble switches: Musette I (M1M2M3), Bassoon (L), Bandoneon (LM1), Accordion (LM1M2), Master (LMMM), Violin (M1M2), Clarinet (M1), Musette II (M1M3), and Close (acoustic Mute, allows for electronic solo performance). 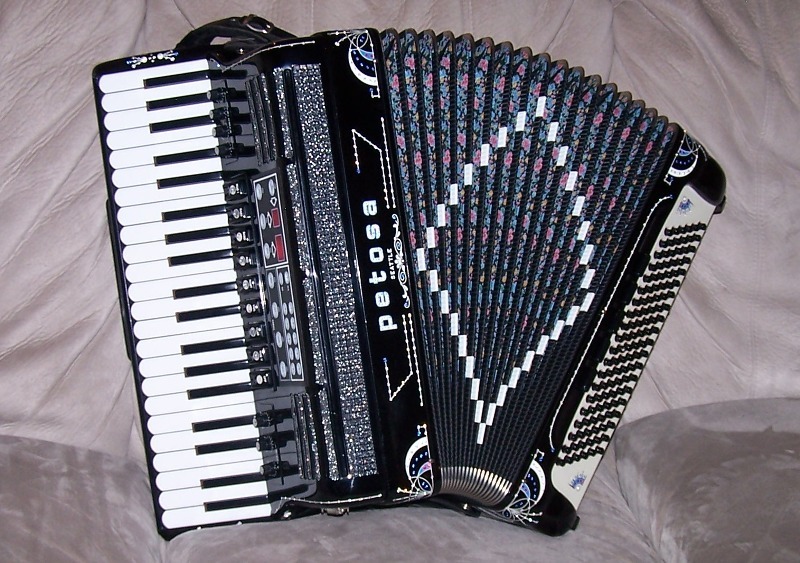 The reed combinations highlighted in blue and musette tuned, the other switches produce a concert (dry) sound. 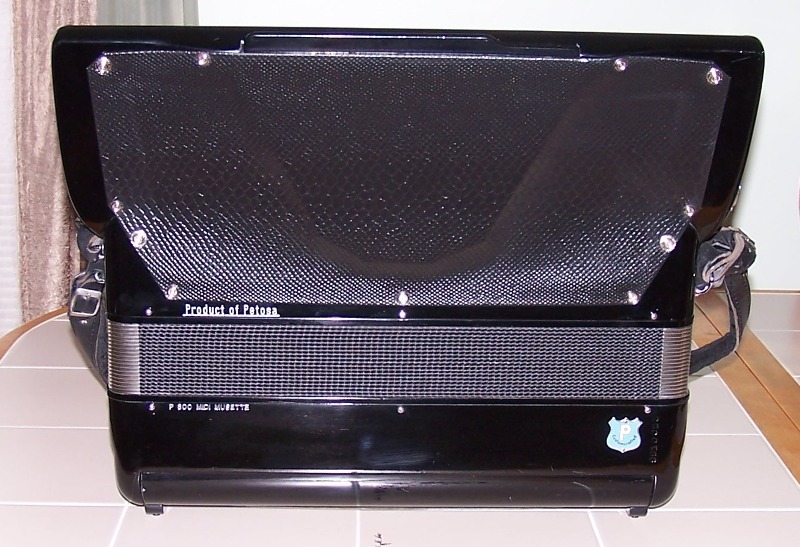 This instrument is excellent, both acoustically and cosmetically. 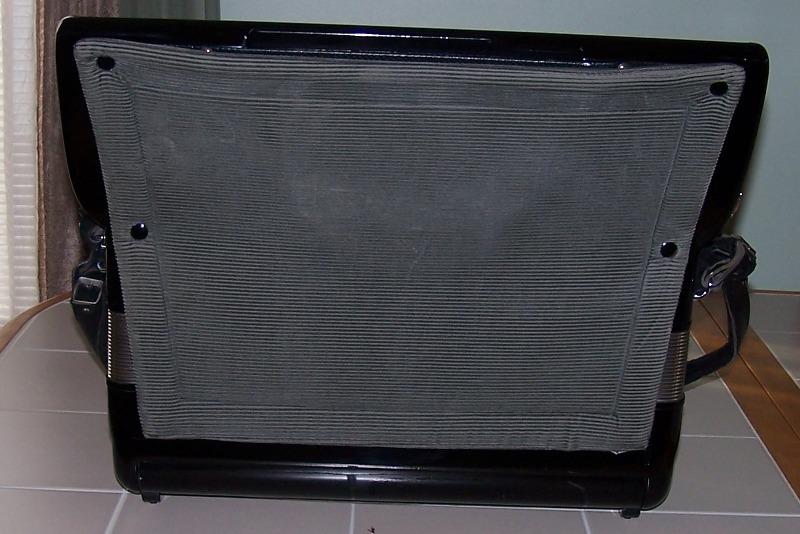 The acoustic balance between treble and bass is excellent. 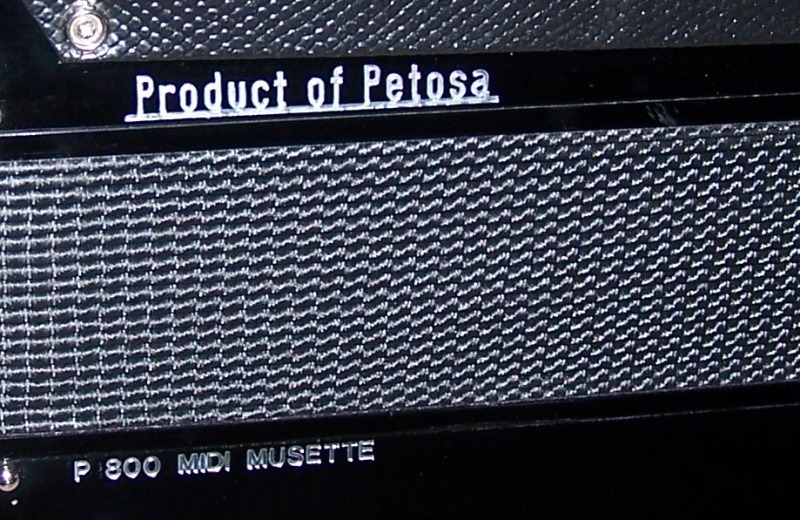 The compression in excellent. 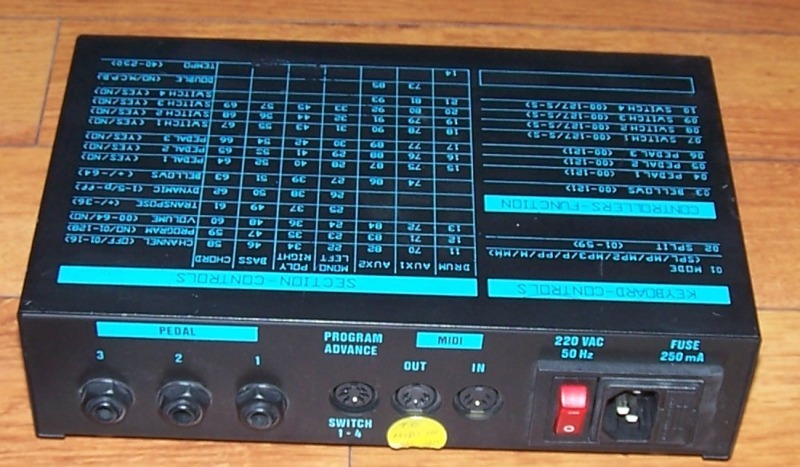 I really like the fact I could have a dry/concert violin switch as well as musette tuned violin sound. 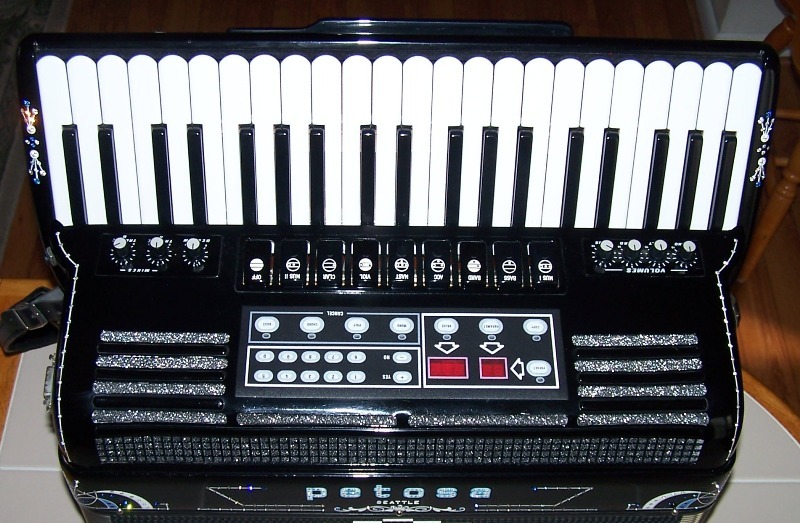 With the custom tuning you can play a variety of music and always enjoy an authentic sound. 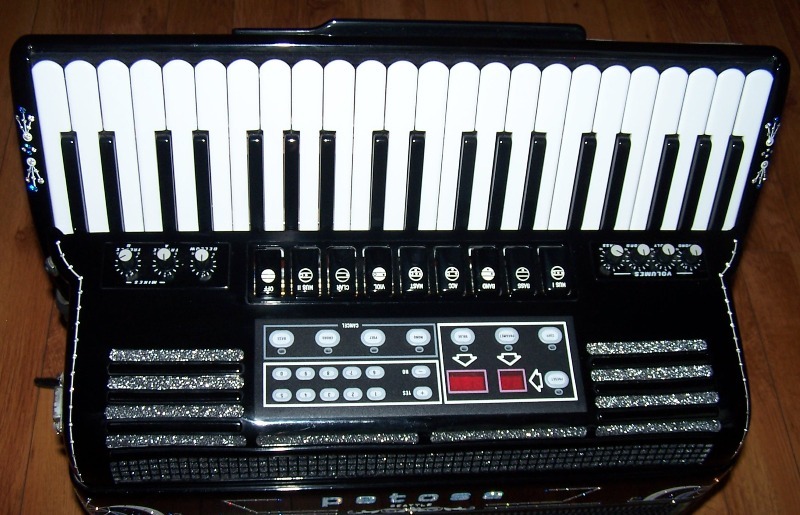 The orchestral capabilities of the MIDI will open a whole new universe fro musical expression. 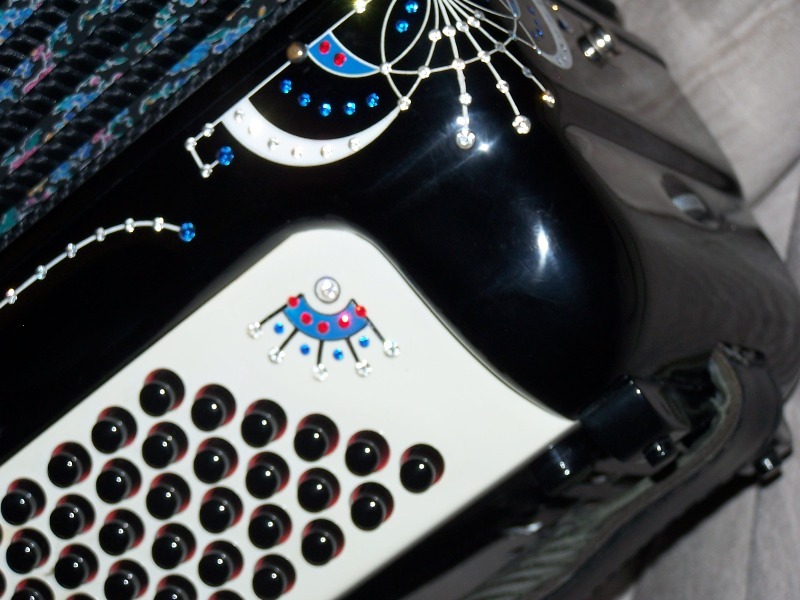 LAst but not leas, the instrument looks beautiful with its custom engravings Swarovski crystls decoration. 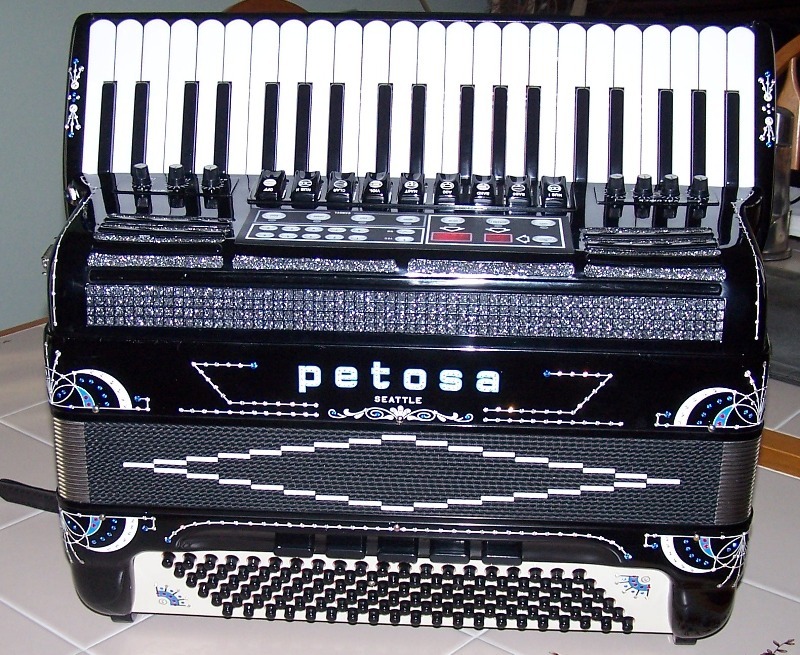 Petosa accordions have always been among the best crafted in the industry. 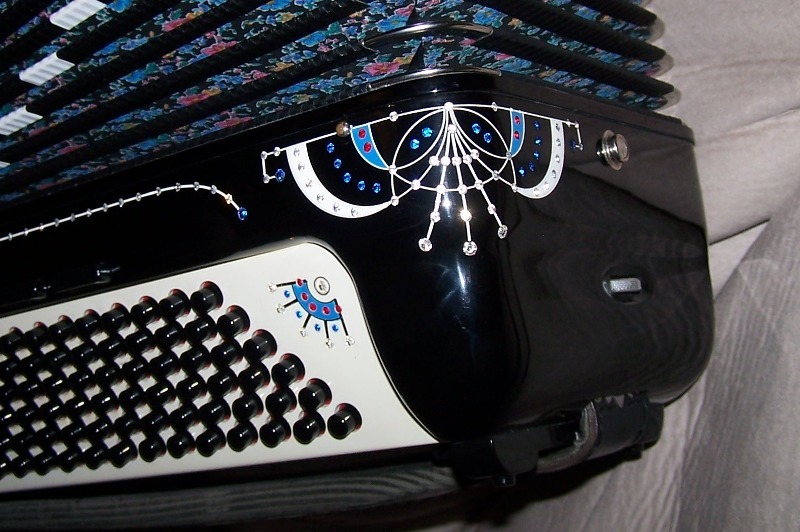 I hope you enjoy the pictures below and would be glad to hear from you if you've already experienced the charm of this accordion or would like to know more about it. 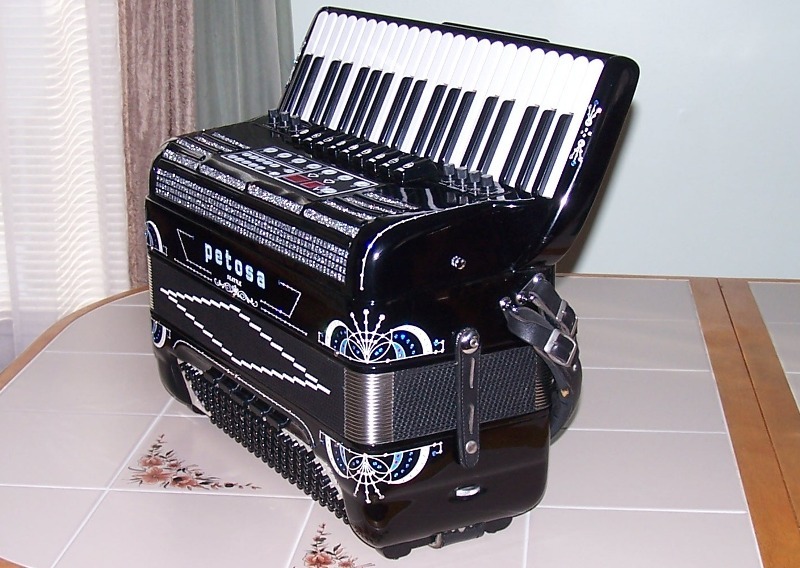 with the performers right leg while the instrument is played in seated position. and friends but perform at large community or corporate events. 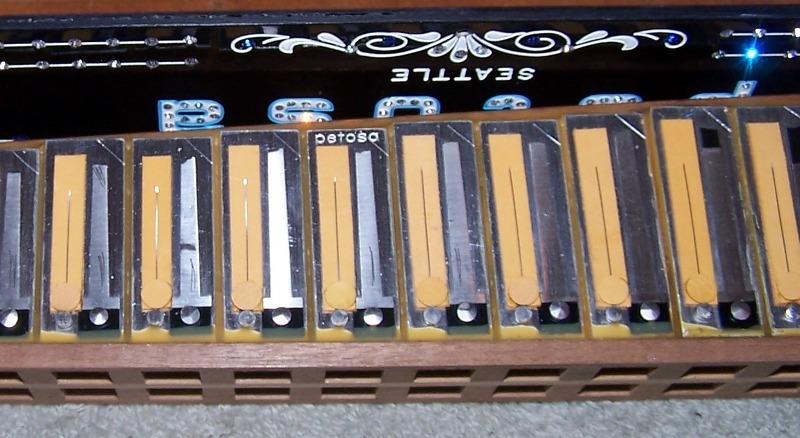 All hand-made reeds and genuine leather valves are in excellent condition. 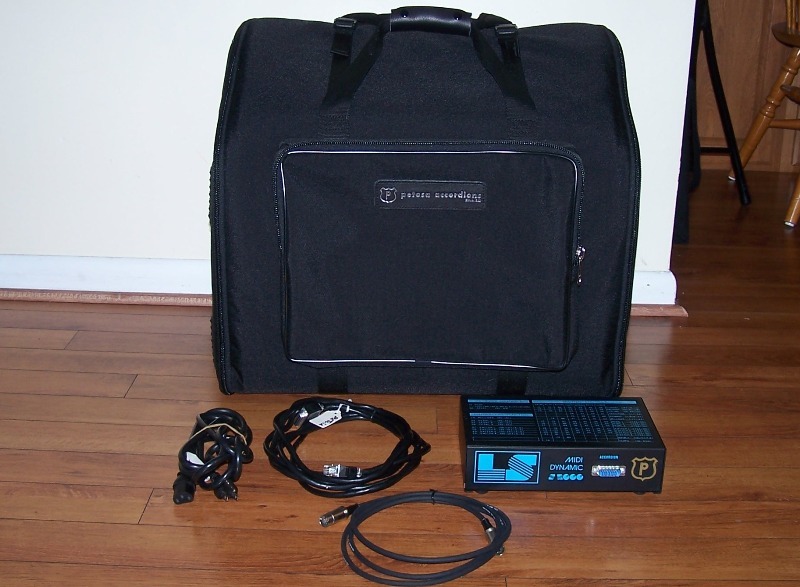 The installation of the electronic components is neat and professional and doesn't create any clutter. 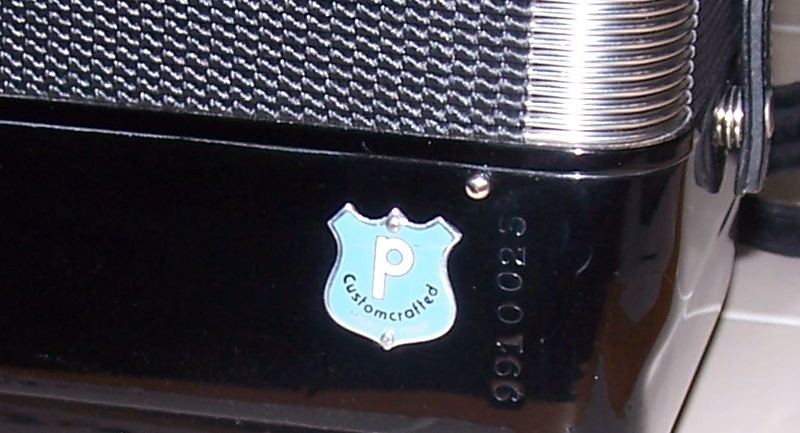 Below are several close-up views of the custom engravings of the instrument. 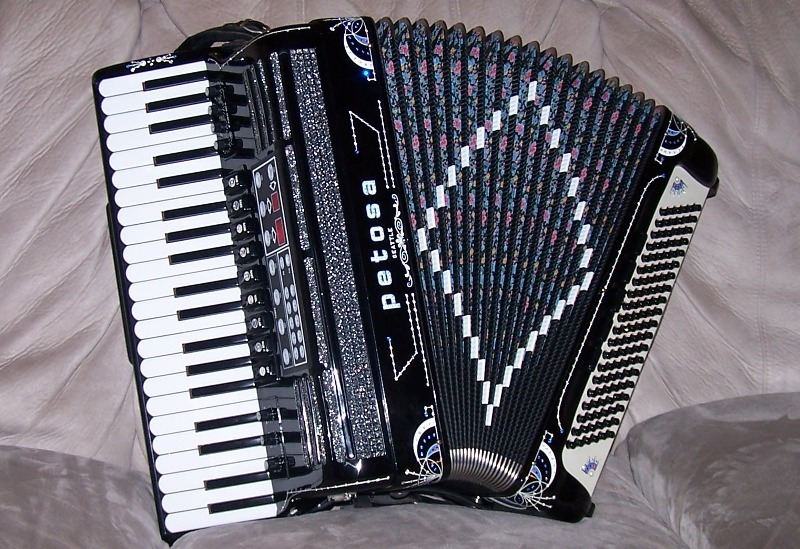 Call 973-770-6877 with any accordion-related questions.